Kerri and Noah met through friends during the regular Tuesday evening gathering at a local ‘cantina’. Kerri had recently moved to town after finishing her graduate studies and Noah was a PhD student. They met up as a group nearly every week, discussing interesting things they’d read, troubleshooting scientific problems, and coming up with ideas for future science projects. A love of science is one of the first things they realized they shared. next evening after that. And essentially every day from that Friday night on. They moved in together four months later and brought home Ferus, the fiercest of all kitties, eight months after that. proposed. Plans were quickly made and a wedding date was set for just four months later in Portland – one of their favorite cities! Since working together on creative projects is something they love to do, they knew straight away that they would DIY as much as possible. Of course to get started, they needed the all important color scheme! 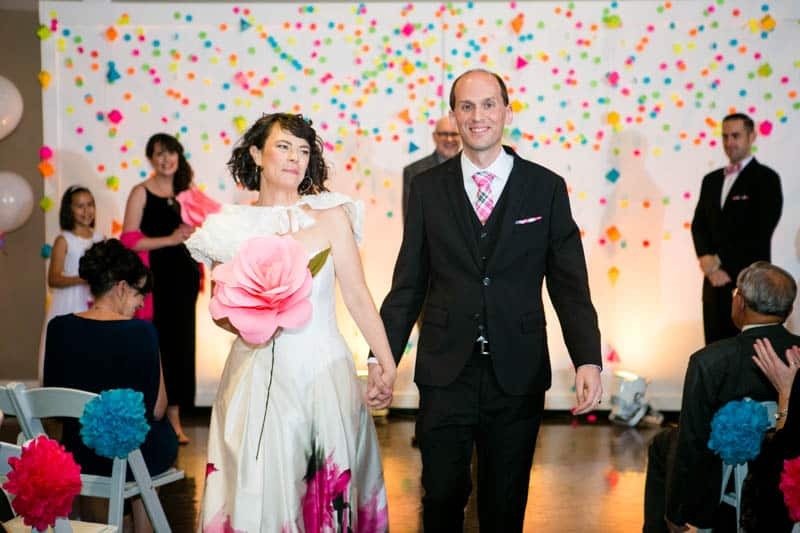 They realized they were drawn to the most colorful design inspirations and that this really represented the fun and happy feeling they wanted to share with their friends and family at their wedding. So the idea of using ‘CMYK’ (Cyan, Magenta, Yellow, and Black) or “ALL THE COLORS” become the central theme. “We were extremely lucky to have many family and friends help us with the various paper crafts and decor items that we planned (including growing wheatgrass for the centerpieces)!” Kerri told us. “They were also our go-to helpers on our wedding day for setup” she added.